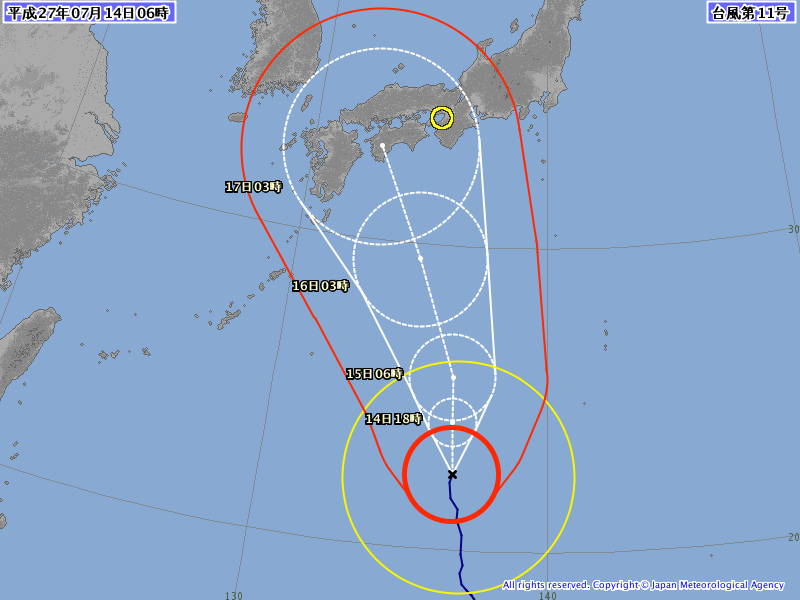 This is the current projected path of typhoon #11. See the white circles? That's the probable area of strong effect. Se the small yellow circle? That's Osaka with Kansai Airport in the center. That last, big white circle? That's the projection for Friday at 3am. That's a few hours before our morning flight from Kansai Airport to Prague. Yes, the center of that small yellow circle. We night have a problem. It's not just the flight itself; Kansai Airport lies on an island, connected to the mainland by a longish bridge. That bridge closes for traffic if the winds are high or gusty enough. We might have our flight leaving on time but we can't get to the airport over the closed bridge. Time to look for a few alternatives. I'm going to Prague and CNS to hold a tutorial, and that tutorial is scheduled for Saturday, the morning after we arrive. If the flight is delayed by a day I miss the tutorial. And as that's the main point of me being there, that wouldn't be good. We'll see if we perhaps can rebook the flights a day earlier (though that adds another hotel night) or perhaps fly from Tokyo (adding the cost of both hotel and train). If neither is possible — or they ask for too much extra money to rebook — we'll just have to take our chances and hope we leave on time after all. As they say: oh well. I did the JLPT again last Sunday. Gave it one more shot to see if I might pass it. I won't. The listening comprehension isn't too bad — it'd be odd if I didn't do well at that by now — and I can sort-of digest most texts they throw at you. But grammar... It's not just that I'm not good at grammar; it's that I find it boring and tedious, and really, really dislike studying it. "It's amazing what you can't accomplish if you really don't want to." as someone said. So I give up on JLPT for now. I don't actually need the test for anything, and it robs me of the enjoyment I normally find in learning the language. Instead I'll go back to reading fun stuff again — I haven't read a line in my latest mystery novel for months — and on improving my writing skills. Real-world useful skills (such as knowing terms for "autopsy" and "blunt instrument") rather than test questions. Perhaps I'll try again in a few years. We're going to Prague in a week. The CNS 2015 conputational neuroscience conference is held between July 18-23, and we'll hold a tutorial on using NEST, MUSIC and other simulation tools. I'll have a poster on our current work of course, and there are some interesting-looking workshops at the end of the conference. While I work, Ritsuko will spend the week rambling through the streets of Prague. I've been to Prague once more than 15 years ago, as a grad student, and I remember it as perhaps the most beautiful city I have ever visited. I'm both anticipating and dreading the return visit. I hope that it will be as amazing as it was that one time; and worry that my nostalgia-tinted memories are setting me up for disappointment. The weather is uncommonly lousy this year. We have two typhoons approaching at the same time (I hope our flight next week is OK), and it's been raining almost every day the past few weeks. The only upside is that the train smells less of Eau de Sweaty Salaryman than it usually does this time of year. But this morning, as I was walking from the station, I heard the cicadas for the first time this year. Not a lot of them, yet, and the morning drizzle put a damper on those that were there, but at least there's hope that the rainy season will soon be over. It better be; our umeboshi will need sun-drying in a few weeks. In an ideal world we'd leave our offices around midday and sit down for a leisury two-hour meal with our families. A few hours of slow home-cooked food and brisk conversation to clear our minds before we stroll back to work for the afternoon. For most of us that ideal world does not exist. We have half an hour at a local lunch restaurant or a quick convenience-store bento before going back to work. And sometimes we're reduced to eating a sandwich or instant ramen at our desks. Almost everything you need for a nice lunch. You need a pack of ramen. This time I use old-fashioned Chicken Ramen, but any kind is good. I also got a small bag of store-brand cut vegetables — lettuce and corn in this case. And I brought the raw egg from home in the morning. For cooking you only need a pair of chopsticks and a microwaveable bowl with a lid. Start by heating water in the bowl. It takes about four minutes. Feel free to surf the web while you wait. 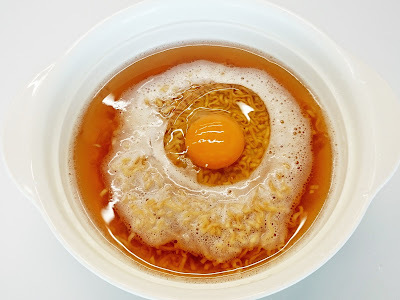 Add the ramen into the almost-boiling water. 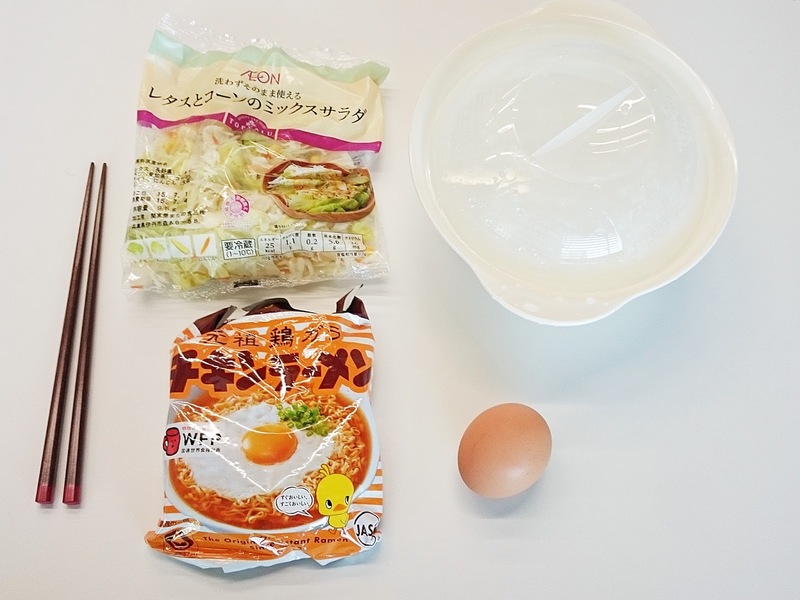 Chicken Ramen is a little special since the flavouring is mixed with the noodle, not in a separate bag. 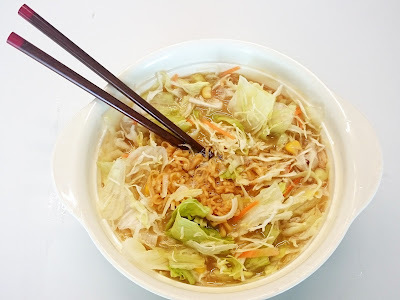 That makes the noodles really tasty even before they're cooked, by the way; and Nissin even sells pre-broken Chiken Ramen noodles as a snack. 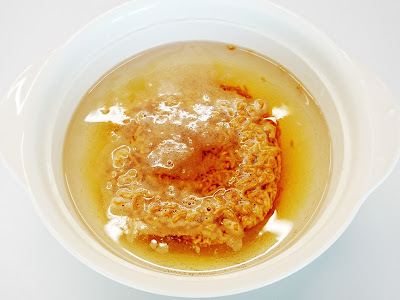 Cook the noodles in the microwave. Use the same time it says on the packet. You can cook pasta in the microwave in this way too. Add the egg, and mix. Add the egg and mix it roughly. You don't actually want the egg to set; instead it should thicken the soup and make it thick and filling. The egg adds protein, rounds off the flavour and makes it less salty. Mix in the cut salad. Lastly, mix in the cut salad into the thick soup. You have soft, springy noodles and crunchy, fresh vegetables in a thick, rich soup. Add an orange or apple for dessert and you've got yourself a meal!